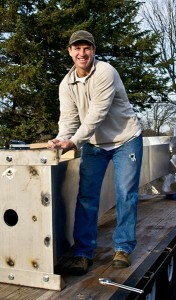 Large scale sculpture is expensive to make, a challenge to move and difficult to sell, none of which deters Dale Rogers. 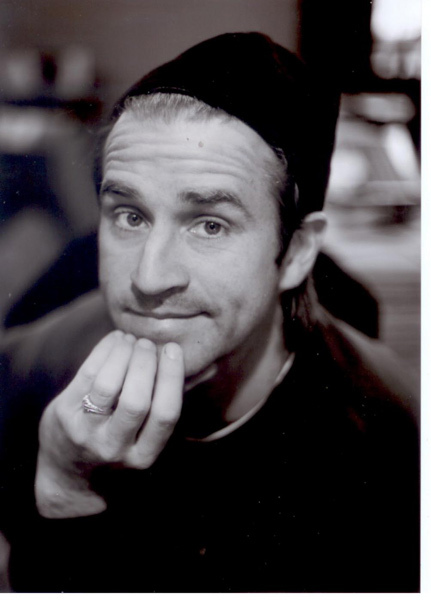 His business acumen and energy level have propelled his career as a successful sculptor, allowing him to make an excellent income doing the work he loves. His work has been purchased by sculpture parks and municipalities all over the U.S. and by hundreds of private collectors. There is also a book about Dale’s sculpture in the works. fifteen or more weeks a year on the road. He keeps his prices down by buying steel in bulk, has it laser cut to minimize labor time when fabricating and carefully plans out his designs using Form Z software to minimize waste. His works are priced from $3,000 to $30,000 or more. He sets a personal goal of selling fifty $5,000 pieces a year. Last year, in spite of the economic meltdown, was his best year ever. Dale produces. 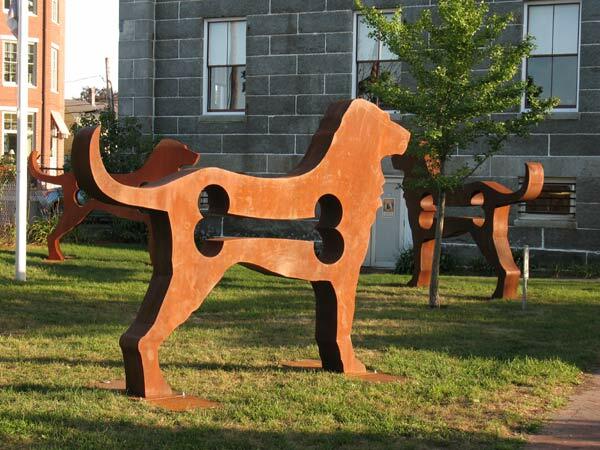 Dale has been promoting his Big Dog Show, a grouping of 20 to 100 large scale, 500-600 pound Corten steel dogs with 150 pound bases that have already been shown at several public spaces, sometimes earning funds for humane society work. He has been known to load and unload twenty of these brutes himself, with no assistance but a winch. Dale is a wild man with a plan. The following is an interview with Dale and his assistant Allisa. We couldn’t use our client list for voting…ArtPrize has a very tight voting process & you must be present in the city of Grand Rapids to register to vote. 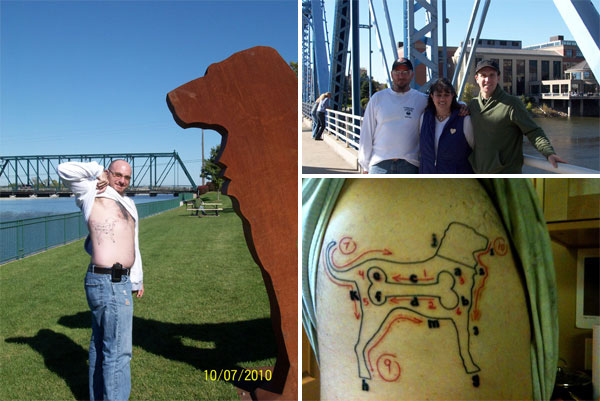 We connected with the park via the ArtPrize website. Venues that are interested in hosting artists sign up and make their specifications known. Then, the artists register online, giving specifics on themselves as well as their exhibit. You must be invited by a venue. Dale was approached by several, but he felt this park would showcase his exhibit the best. We did have a connection with the Humane Society of Kent County who had a connection with a gallery near the park. IF he won….he wanted to use the money to fund an even larger exhibit….100 dogs ! The story behind your angel commission on your blog was intriguing… you did the drawing, then the same day someone approached you looking to commission an angel. Perfect. Have you had any other clairvoyant moments? In all honesty, 2 years of sobriety & a clairvoyant haze are kind of a fine line. Sheer creative clairvoyance came early in my career. Now my epiphanies seem to come more in a past/present/future process & less based solely on creativity….I’m not sure if it is due to change of lifestyle or more life experience. My body of work builds on present…..logistic & money available to me……future…how will this enhance my resume or cash flow & what are the logistics of moving an inspirational body of work around. 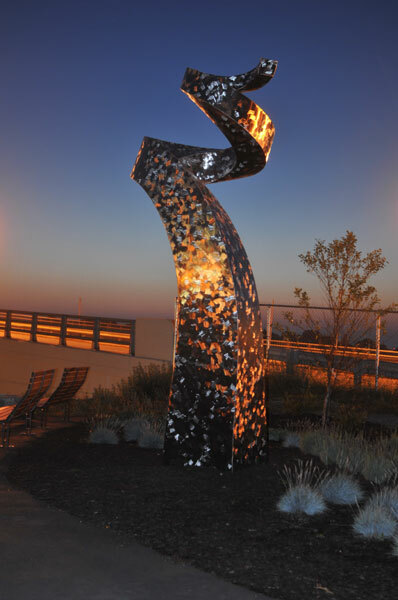 The big spiral sculpture you did for the new Newburyport Rail Trail really catches the light and looks great there. What is it called? How tall is it? What type of stainless steel is it made of? It is called G-Swirl. The one on the rails trail is 16 feet tall. It is made of 316L Stainless Steel. How many employees do you have? Do you still have the CNC plasma cutter? Is all of your work TIG welded? 3 employees…Allisa ( office work ) Gregg ( Welder) Dale ( design, sales & welding) He still owns but doesn’t operate plasma cutter….We send out to Salem metal in Middleton MA to be laser cut….You are correct….all is tig welded…laser cutting provides a cleaner surface for that. It is a very good move that you plasma cut your name on every piece you do. For instance, of the rail trail sculptures, I think yours is the only piece that’s identified. You have a good website and you’re on the typical social networking sites. How else do you get your name out there? Number one method of marketing my work is art & craft shows nationwide. You have a degree in business, which differentiates you from lots of other sculptors who struggle with the business aspects. What is the most valuable business tip you could share with other sculptors? Keep expenses under control and keep ego out of pricing. Always toying around with Sydney sculpture exhibition, once again when it comes up….it goes into a past/present/future thought process. Do we have enough money to do it? How old are your kids now? Are any of them going to follow in your footsteps? 8, 5, 4 not encouraging them to follow, I like to think of guiding them to a pursuit of their own happiness. Have you done anything differently because of the current sluggish economy? The Big Dog show in 2009 was a calculated execution of a marketing campaign to meet the economic slowdown head on. Whether due to that or sheer hard work in 2010, we have had one of our best years. What survival strategies have worked best for you? I keep my prices brutally low. Which of your sculpture experiences mean the most to you? Why? 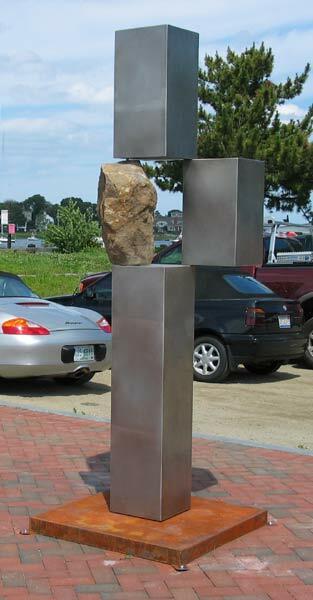 One of my very first pieces, Madison….it was 3 cubes with a stone….it was my first mid size range piece (6′-8′ feet high). It started me down the path of large scale sculpture where I am still today. 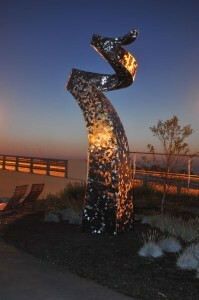 This entry was posted in creative living, Interviews, process, reviews, sculpture and tagged contemporary art, Dale Rogers, public sculpture, sculpture. Bookmark the permalink. Post a comment or leave a trackback: Trackback URL.